Canine Cushing's disease (aka hyperadrenocorticism) is an endocrine disease in which there is excessive production of the cortisol hormone in the adrenal glands. As a result, dogs with Cushing's disease have an abnormally high concentration of cortisol in the blood for an extended period of time (over weeks and months). The excessive amount of cortisol in the blood has an adverse effect on the dog's metabolism as well as on the function of many system organs. Cushing's disease usually occurs in older dogs. Small breed dogs (e.g. terriers) are more likely to develop the disease. What are the Symptoms of Cushings in Dogs? What Causes Cushing's Disease in Dogs? What is the Treatment for Cushing's in Dogs? Cortisol is produced by the adrenal glands, which are two rather small glands located next to each kidney. Adrenal glands are stimulated to produce cortisol by a hormone called adrenocorticotropic hormone (ACTH). This hormone is produced by the pituitary gland - a small, pea-sized gland located at the base of the brain. Cortisol is a very important hormone that helps to regulate the body's metabolism. This hormone is released into the bloodstream at times of stress to prepare the body for a "flight or fight" response. The amount of cortisol produced varies depending on the situation. When a dog is under stress, for instance, the production of cortisol will be increased. Once this period of stress is over, the cortisol concentration will be back to normal. Why is cortisol released at times of stress? It is because cortisol in the bloodstream triggers the release of glucose in the liver. Glucose provides energy for muscles in stressful situations in case the body has to either fight against an invader or escape from it. As you can see, some of the symptoms above are very similar to those associated with the normal aging process. Weak muscles, lethargy and incontinence can easily be attributed to "aging". As a result, it is difficult to have an early diagnosis of Cushings disease in dogs. Therefore, it is advisable to carefully monitor the changes in appearance and behavior of your dog, especially if you have an older dog. 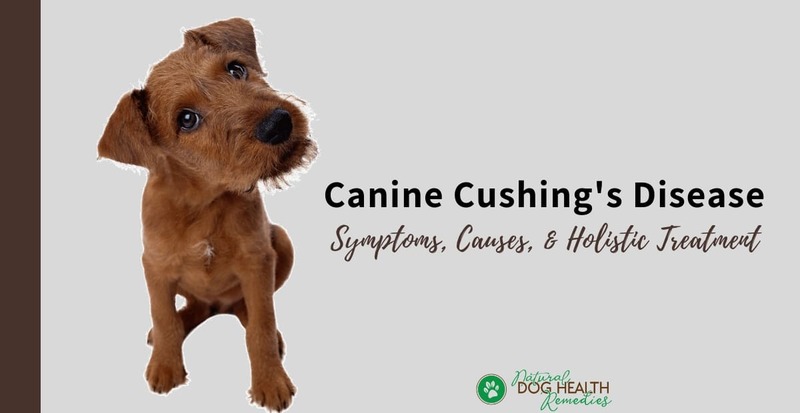 In addition, many dogs with Cushing's disease are mis-diagnosed as having liver problems because they tend to have elevated liver enzymes (ALT and ALP). The reason is that the liver is working hard to process the excess cortisol in the body. If a blood test reveals high ALT and ALP levels, but your dog shows some of the above symptoms, it is possible that he is actually suffering from Cushing's disease. Pituitary Dependent - Pituitary dependent cushings is caused by a tumor (benign - not cancerous) in the pituitary gland. The tumor causes the pituitary gland to produce too much ACTH (the hormone that stimulates the adrenal glands to produce cortisol). Too much ACTH means too much stimulation to the adrenal glands. The result? Excessive production of corticol. Adrenal Dependent - Adrenal dependent cushings is caused by a tumor in an adrenal gland. The tumor causes the glands to produce excessive cortisol. A majority of the cases of canine Cushing's disease (about 85%) are pituitary dependent. Adrenal tumor-induced Cushings disease can be treated by surgically removing the tumor. 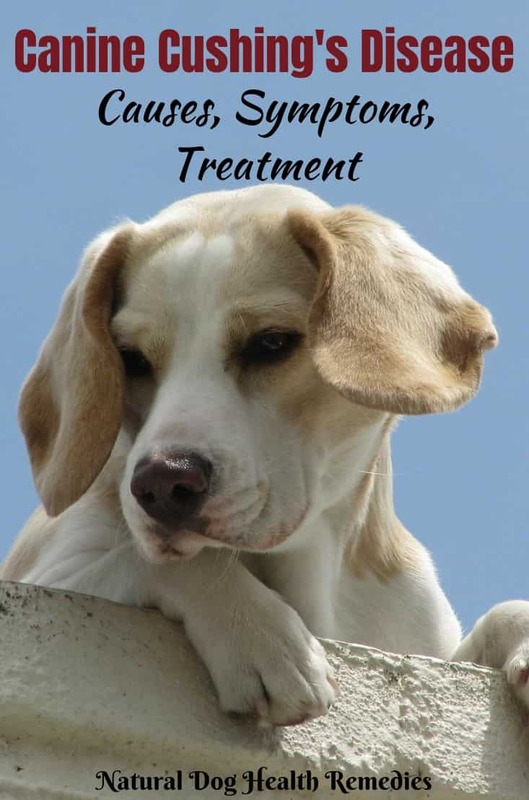 Drug therapies are available for Cushings disease caused by pituitary tumors. But it cannot be cured since surgically removing pituitary tumors is simply too risky because the pituitary is too close to the brain. In 2008, FDA approved the drug Vetoryl (trilostane) for treatment of both pituitary- and adrenal-dependent Cushing's in dogs. The drug works by stopping the adrenal glands from producing cortisol. Sometimes in some dogs, more serious side effects (some fatal) may occur as well. Another FDA-approved drug for treating canine Cushing's is Anipryl (selegiline), which is used for the treatment of pituitary-dependent Cushing's in dogs. Anipryl can also cause possible side-effects, which include (but aren't limited to): vomiting, diarrhea, hyperactivity, anorexia, seizure, and lethargy. There are also off-label drugs that vets sometimes prescribe to manage Cushings disease in dogs. Two such drugs are Lysodren (Mitotane) and Ketaconazole (Nizoral). Lysodren kills the outer layer (cortex) of the adrenal gland. Careful monitoring is necessary to determine how much of the cortex is killed so that a healthy amount of cortisol can still be produced. Lysodren is toxic and requires careful handling. Wash your hands thoroughly after giving this drug to your dog. Ketoconazole suppresses cortisol secretion in the adrenal glands. It requires daily dosing (at the beginning stage of the treatment), monitoring, and of course careful observation by the pet owner. This drug is less toxic than Lysodren. Dogs with Cushing's disease can benefit greatly from a special diet and some dietary supplements. Be sure to read this article for more information.